It was just exactly what i expect from a hostel! Nice room, nice people, nice food and very good tours were organized too - thank you! What an outstanding place! I was worried because it's been my first travel alone ever - but the people and the atmosphere here made me immediately feel as if I am surrounded by lots of friends. Very open, helpful and warm staff and guests! I enjoyed our "family dinners" at night as well as the free, guided tours. The rooms are sufficient, the bathroom clean. Perfect location, you can walk everywhere from here. All in one, I can't complain. Hope to come back one day! My first hostel ever and it was the best experience! The staff wos SUPER nice and the other guests aswell. It was like a big family. You should always do the free tours and the pub crawl. Dinner time is also one of the many highlights! 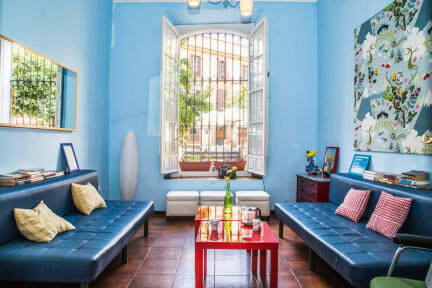 I really enjoyed my stay at the Hostel One centro Sevilla. Everything was very clean and staff was very friendly and helpful. They had good recommendations and many suggestions of what to visit in the city. I was also happy about the daily and very delicious dinner for free which connected all guests. I would for sure come back! Thank you! Really great staff at hostel one centro! It is a great place to meet other solo travellers and the activities organized by the volunteers are a great way to explore the city. A nice hostel in a great location! The ataff is really nice and caring. The building is nice and the interior is nicely decorated. Unfortunately my room had no window and it was a bit smelly, so I had no chance to air the room. There was a bathroom en suite, that defenitely could have needed a clean up. But still it was ok and I'd probably come back. Really nice and cosy hostel, with a nice atmosphere. Besides that, it was a pity that the staff (mostly vonlunteers) built an own group, partly excluding guests. In my view they were busy with themselves rather than interacting a lot with the guests.